Nestled between the Infiniti 105 and the Infiniti 60 is the Infiniti 85. The 85 features the same design DNA that makes an Infiniti yacht lighter and faster than comparable vessels, but this modern Maxi has the power to lead the Class in a whole new direction. Equally at home on the racing circuit or comfortably cruising the Mediterranean, the Infiniti 85 carries the unmistakable lines and performance of the Infiniti range. As with the Infiniti 105, there are two bow and sheer line options and the 85 also features the same glass coach roof styling, which extends over the saloon. Here you’ll find an open plan galley on the port side, with a large sofa arrangement opposite – slightly more conventional than the arrangement on the 105. 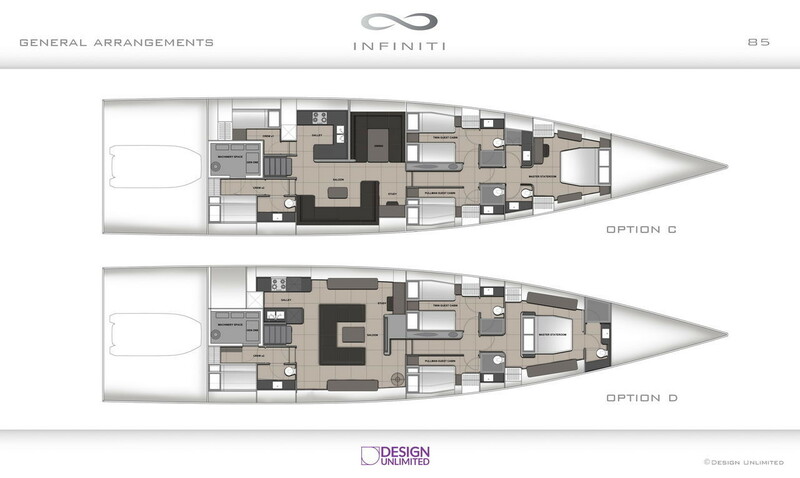 The Infiniti 85 can accommodate 6 guests in 3 cabins.